I used to have a bad habit of looking in the direction I wanted my weights to move, as if that would somehow help the weights reach their destination faster. In back squats, for instance, I would look straight up at the ceiling, wrenching the heck out of my neck in the process. It took the corrections of a coach to fix my issues, but I still need a reminder from time to time. Keeping your spine neutral is vitally important to avoid injury and for you to maximize the power you are able to put into your lifts. If you’ve ever had neck pain or a bad headache after squatting, you likely lost your neutral spine position. In the short term, this is going to hurt the next day, but over time, this can turn into neck impingement issues or even herniated discs. Hyperextension of the spine happens when you look straight up during the squat. You also want to avoid flexion of the spine that can happen when you look too far downward, causing you to excessively round the spine. The head tends to follow where the eyes are looking, and it’s much easier to relate proper spine position to an athlete by instructing them where to look during their lifts than to try to explain where to place their head. Varying your focal point as needed according to the lift will put your head in the proper position, and this will result in a nice, safe, neutral spine. For back squats, focusing on a spot about six feet in front of you should be about right for most people. The same focal point works well for deadlifts. You want to vary your focal point in front squats a bit, as looking too close to you will result in rounding of the spine or cause you to fall forward. You may find looking at a spot on a wall across the room will help maintain your neutral spine better for front squats. Concentrate on keeping those elbows and chest up, but don’t lead with the chin or head. 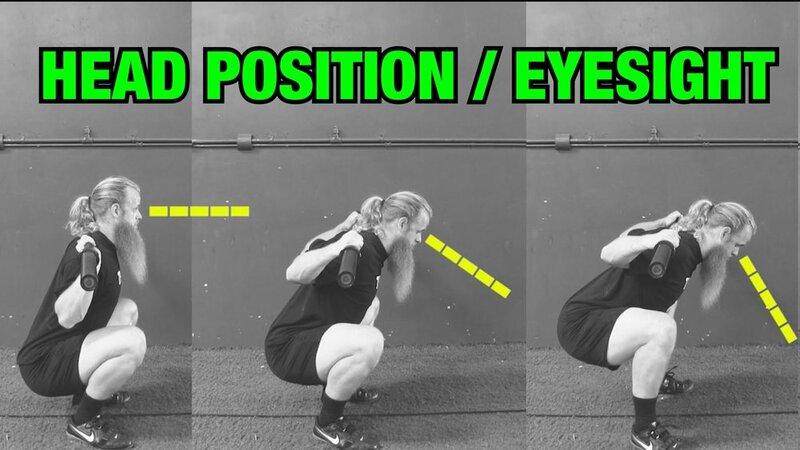 This focal point also works well for overhead squats. As the load on the bar increases, it will become harder and harder for you to manage a poor spine position. Practice proper head position even on those “easy” warm up lifts to develop that muscle memory so that you maintain good alignment when you need it most on those heavier lifts. And just a quick note here on gym etiquette. If someone is squatting, don’t walk or stand directly in front of them. You might be blocking their focal point and messing up their lift. This dude is a bit intense, but his video does a pretty good job at explaining how and why proper head alignment is something you want to get good at. As always, our coaches are here to help you and make corrections as needed. Hopefully, this information will allow you to understand the “why” of their corrections a bit better.